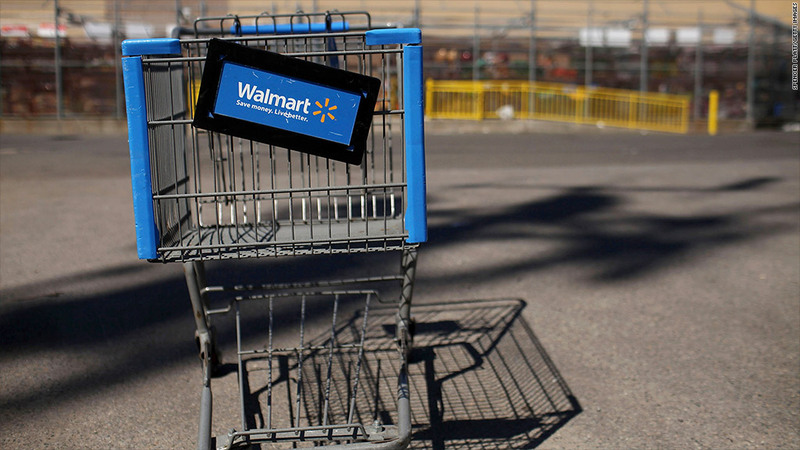 Organizers say Black Friday strikes are being planed at about 1,000 Wal-Mart stores. A group of Wal-Mart workers are planning to stage a walkout next week on Black Friday, arguably the biggest holiday shopping day for the world's largest retail store. The walkout builds on an October strike that started at a Wal-Mart (WMT) in Los Angeles and spread to stores in 12 other cities. More than 100 workers joined in the October actions. One of the workers who plans to join next week's walkout is William Fletcher, who works at a Wal-Mart in Duarte, Calif.
Fletcher, who also participated in the October strikes, claims Wal-Mart cut his hours after he asked to move from the receiving department to another division because of a knee injury. He has since switched departments. "I kept asking myself, 'when is the retaliation for speaking our mind and acting on our rights going to stop?' " he said. Wal-Mart did not have an immediate comment in response to Fletcher's claim. The union-backed groups OUR Walmart and Making Change at Wal-Mart, and a watchdog group Corporate Action Network, are calling on the nation's largest employer to end what they call retaliation against employees who speak out for better pay, fair schedules and affordable health care. On Black Friday, the organizations expect 1,000 protests, both at stores and online. A Wal-Mart spokeswoman said the number of workers who are raising concerns is very small and don't represent the views of the vast majority of its workforce of 1.3 million. But labor experts say that even a small number of workers could make an impact. "Even if there aren't that many people, it could have an effect, because their campaign in front of stores could discourage shoppers," said Ken Margolies, senior associate at the Worker Institute a Cornell University. The strike could have an even greater impact if workers from its supply centers participate, according to Margolies. He said it could impede distribution of merchandise on what is usually the busiest day of the year. Organizers have planned a social medial blitz, mobilizing workers through Facebook pages, a YouTube video, Twitter and Tumblr. They're also using online platforms to collect donations to sponsor striking workers. So far, the campaign has raised more than $22,200. Wal-Mart workers have been battling with management over pay, benefits and their ability to speak up for years, experts say. According to Anthony Bianco, author of Wal-Mart: The Bully of Bentonville, butchers at a Wal-Mart supercenter in Jacksonville, Texas, voted to form a union in 2000 -- the first time employees had done so. But soon after that, Wal-Mart eliminated butcher departments in its stores across the country, he said. It has been reported that Wal-Mart said it got rid of its meat department as a cost cutting measure. A similar thing happened when workers at a Quebec store attempted to unionize in 2005, Bianco said. Wal-Mart closed that store a few months after that. The company said at the time that its decision was prompted by the union wanting to change how the store operated.